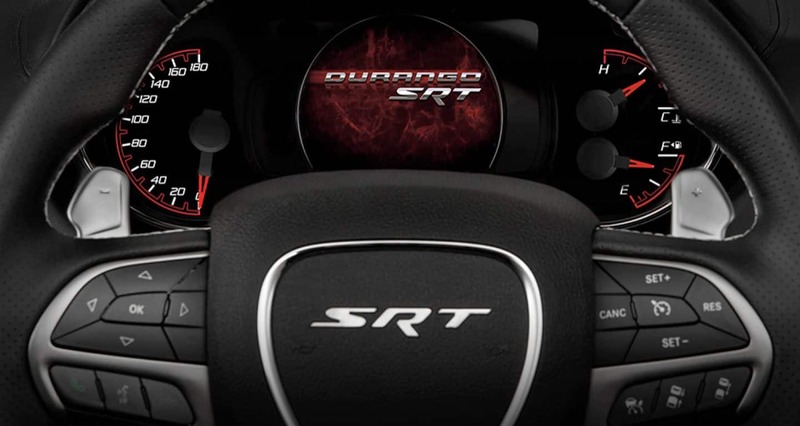 For the first time, the SRT power is available in the Dodge Durango. So if you love the Dodge Charger SRT but need a little more room the new 2018 Dodge Durango SRT is the vehicle for you. The new Durango SRT boasts America's best horsepower and torque ratings making it the most powerful, capable and the fastest three row SUV on the market. What kind of engine does the new 2018 Dodge Durango SRT have? The Durango SRT is the most powerful three row SUV, with its legendary 475 horsepower 392 cubic inches HEMI® V-8 engine no others can compare. With seven different drive modes; auto, sport, track, snow, tow, valet and ECO there is no end to what this SUV can do. 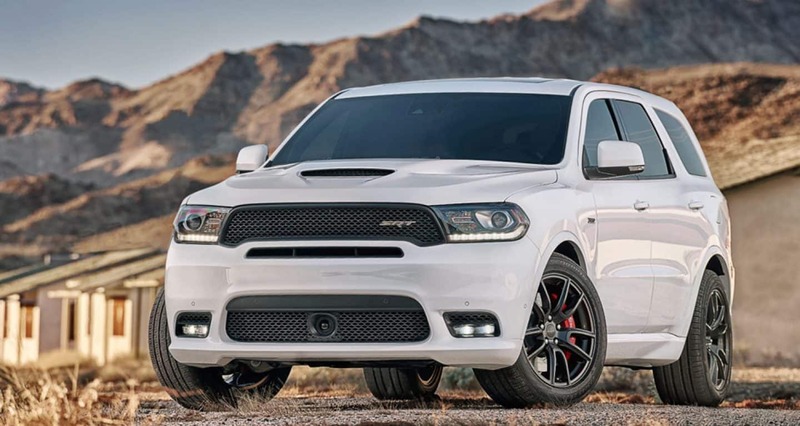 A newly designed functional SRT hood and the 392 cubic inch HEMI® V-8 engine that deliver 475 horsepower and 470 pound-feet of torque allow this Durango SRT to go from 0 to 60 miles per hour in 4.4 seconds. The National Hot Rod Association certified that the 2018 Dodge Durango SRT can run the quarter mile in 12.8 seconds. 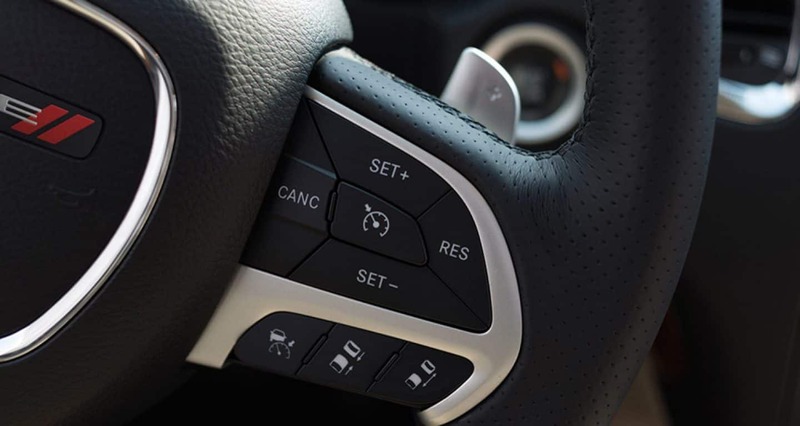 The standard transmission is the TorqueFlite eight-speed automatic which has been specifically calibrated for the Durango SRT to optimize the shift points and deliver the maximum torque to all the wheels. With a towing capability of 8,700 pounds the new Durango SRT out hauls every other three row SUV on the market. What kind of interior/exterior options are available in the Durango SRT? The beauty of this vehicle doesn't stop at the incredible engine, with new exterior performance features like the functional SRT hood with a central air inlet duck that is flanked by heat extractors, wide-body exterior design, new front fascia and lower valence to house new cold-air duct and LED fog lamps the car is a masterpiece. The inside of the new Durango SRT is just as impressive as the outside. With new performance Laguna leather and carbon fiber trim which is being offered for the very first time in the Durango, heated and ventilated front and heated second-row captain's chairs embossed with the SRT logo you can see the beauty. More incredible features include a hand wrapped instrument panel with live silver accent stitch and an SRT flat-bottom performance steering wheel with SRT paddle shifters. The 7-inch thin film transistor customizable digital instrument gauge cluster that includes the all new 180 mph speedometer allows you to select from many different layouts and information. 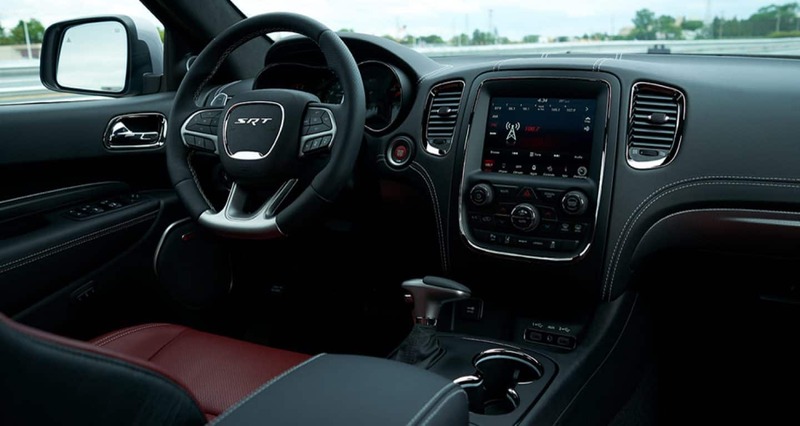 The new Durango SRT also comes with a class-exclusive Uconnect 8.4-inch touchscreen media, where the new SRT Performance Pages are located along with Apple CarPlay, Android Auto, HD radio, navigation, many downloadable apps and a full five year trial of SiriusXM Travel Link and Traffic. Also standard is the BeatsAudio premium sound system which features nine speakers, a subwoofer, and a 506-watt amplifier. And you have your choice of 11 exterior colors to wrap it all together. What safety features and options are available with the Durango SRT? With the incredible engine comes an incredible 60 available safety and security features. These features include the standard all speed traction control and ESC, both of which improve the handling and the performance of the vehicle on and off the road. Other available features include forward collision warning with crash mitigation, Uconnect access with 911 call and roadside assistance, blind spot monitoring and rear cross path detection. Standard features included are the trailer sway control which enhances the very impressive towing capability, the front row active head restraints, full-length three-row side curtain airbags, front seat mounted side thorax airbags. If you're looking for a three row SUV that will make you feel like you're driving a sports car look no further because we have found your answer. The 2018 Dodge Durango SRT is in a class of its own with its incredible horsepower and towing capabilities there is nothing this car can't do. 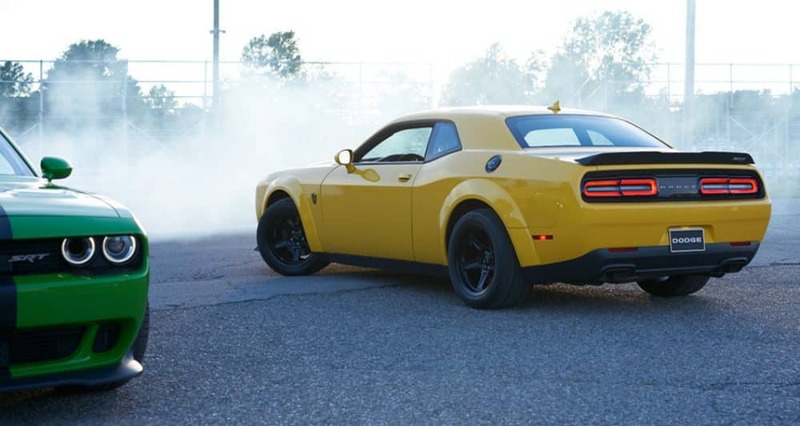 Come in today to feel the power yourself with a test drive and ask any questions!